Stevie Nicks joined Fleetwood Mac seven years after they were formed. Brian Johnson also joined a band seven years after they assembled, one called AC/DC. The Rolling Stones were a band for 13 years before they found Ronnie Wood. Lineup changes within bands are not uncommon, but replacing a lead singer is a difficult task. This was the predicament for New Jersey rock band Youth in Revolt. The band originally went into the recording studio with a multitude of pre-production songs that ended up becoming entirely reinvented. With the addition of new members and a new mature sound, their debut full-length The Broken is perfect timing for everyone involved. The Broken is a full range of emotions and an all-around anthem of growing up. There’s happy, there’s sad, there’s angry; but those emotions are how people find their place in the world and find what ultimately makes them happy. There’s always bad that comes with the good, but it’s the good that triumphs all. The theme of the record ties along with the cover art, a field of flowers alongside a gas mask. “We want people to come together and realize that we can sort of be lost in the world together and as long as we come together and find comfort in each other, we can be happy,” Allen said. 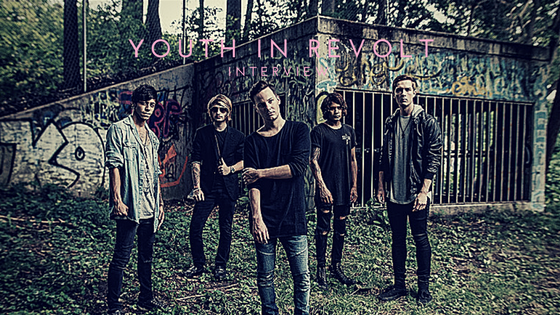 Change is a difficult task but with the mature and collaborative focus of Youth in Revolt, their debut full-length record is another happy emotion in their journey as a band.